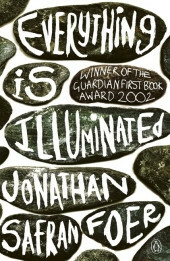 Everything Is Illuminated is Jonathan Safran Foer's bestselling novel of a search for truthThe inspiration for the Liev Schreiber film, starring Elijah Wood A young man arrives in the Ukraine, clutching in his hand a tattered photograph. He is searching for the woman who fifty years ago saved his grandfather from the Nazis. Unfortunately, he is aided in his quest by Alex, a translator with an uncanny ability to mangle English into bizarre new forms; a "blind" old man haunted by memories of the war; and an undersexed guide dog named Sammy Davis Jr, Jr. What they are looking for seems elusive -- a truth hidden behind veils of time, language and the horrors of war.What they find turns all their worlds upside down . . .'An astonishing feat of writing: hilariously funny and deeply serious, a gripping narrative. Extraordinary' The Times'One of the most impressive novel debuts of recent years'Joyce Carol Oates, The Times Literary Supplement'A first novel of startling originality'Jay McInerney, Observer'Showy, smart. Made me laugh a lot' Susan Sontag, The Times Literary Supplement' It seems hard to believe that such a young writer can have such a deep understanding of both comedy and tragedy'Erica Wagner, The Times'A box of treasures' LA Times''Funny, life affirming, brilliant' EsquireJonathan Safran Foer was born in 1977. He is the author of Everything is Illuminated , which won the National Jewish Book Award and the Guardian First Book award; Extremely Loud and Incredibly Close , which is now a major film starring Tom Hanks and Sandra Bullock; and Eating Animals . He is also the editor of A Convergence of Birds.